Weight for this genus is around 2.5–2.8 oz (70–80 g). This species is starling-sized. 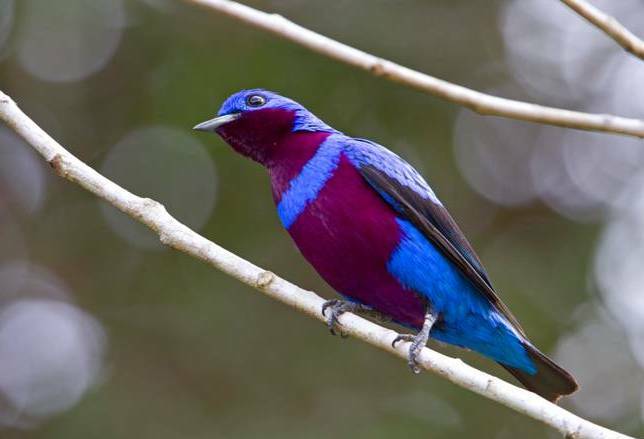 Males are predominantly ultramarineblue coloration, with black on the wings and tail, and separate patches of violet on the throat and breast. Their subcutaneous and perivisceral fat often takes on the blue color of the berries they prefer. 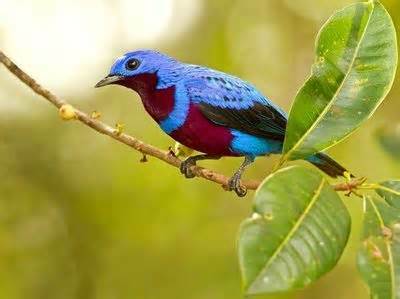 is the spangled cotinga (Cotinga cayana). of the members of this genus is in contrast with their vivid colors. Fruit and berries are consumed, often “gorging” at a masting tree or bush such as mistletoe. The fruits are often plucked on the wing. Although the seeds of larger species (e.g., mistletoe) might be regurgitated, smaller seeds are often swallowed. Insects are also taken. The mating system is not completely known within this group, although for the most part it appears that males display solitarily. The nest is typically platform type, often high in a tree fork, or next to an epiphyte. Although there is a report of one nesting inside an arboreal termite nest. The female incubates and cares for the young alone. Endangered, with habitat fragmentation being the principal threat. Additionally, populations were reduced in the past from over-collecting for the live-bird industry, as well as to provide feathers for “feather flowers” made by Indians and Bahian nuns. 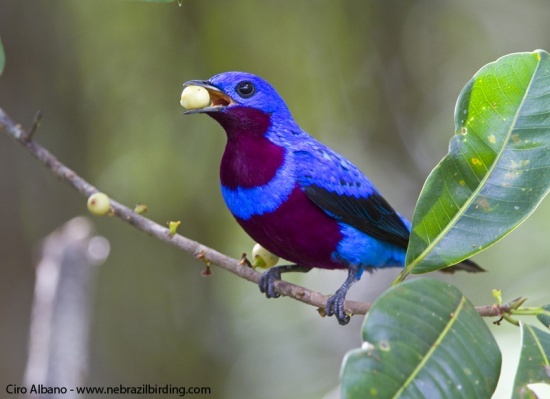 Today however the bird is on CITES Appendix I and is protected by Brazilian law. Its geographic range is estimated at 780 km2. Its numbers are estimated at less than 1,000, with populations declining. 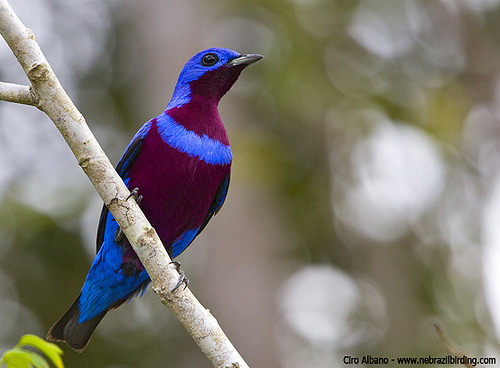 Several indigenous tribes use cotinga feathers in their ornamentation. 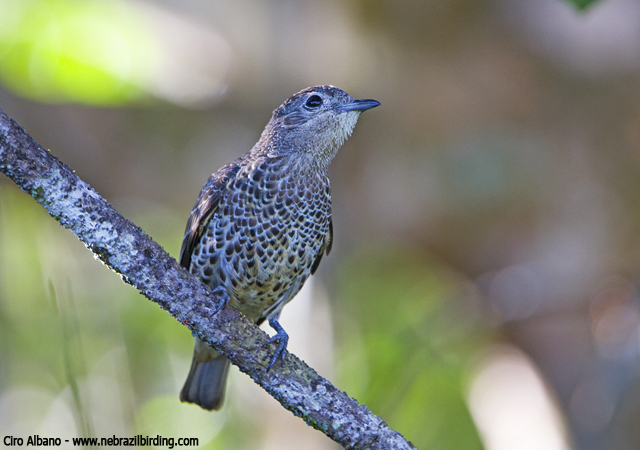 One of the most frequently seen groups is Cotinga, which is commonly represented in costumes of certain Amazonian tribes. Perhaps as many as 10–15% of artifacts have Cotinga feathers, although the most commonly used feathers are those of Psittacids (Ara and Amazona).